I wish I could tell you where I saw this recipe, but I can’t. I did adapt it slightly, but it really makes the perfect football food – quick, easy and tasty. 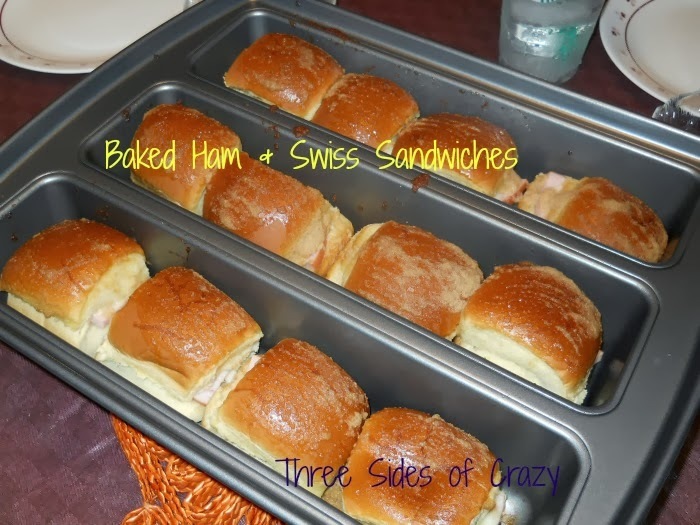 Place a slice of ham and Swiss cheese on each roll. In a small saucepan melt the butter. Add the Worcestershire sauce and seasonings and blend well. Brush the tops of each roll. Cover with foil and refrigerate over night. Serve immediately! They are best hot. As an added bonus they are really good as a “club” adding turkey as well to the ham. *Original recipe called for using a 9×13 pan. I used my lasagna pan and it worked out very well. It’s official! Football season begins tonight. So how about we get this party started?! Come join us. 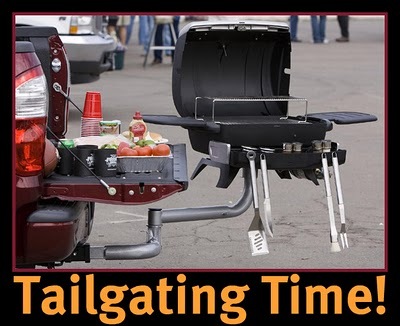 Link up all your favorite tailgating goodies throughout the entire 2013-14 football season! No matter who you are rooting for we’ll have fun. I know not everyone enjoys football, but who can resist a good football food buffet? It’s time to start thinking about tailgating treats, appetizers, chips and dips, wings, and all the other yummy party things! Having a game day buffet just makes it more festive! I remember when I was a kid, My dad was a big LOS ANGELES RAMS fan. We always watched the games together and I was responsible for keeping the game food fun. I loved spending the day with my dad and it was always so much fun. 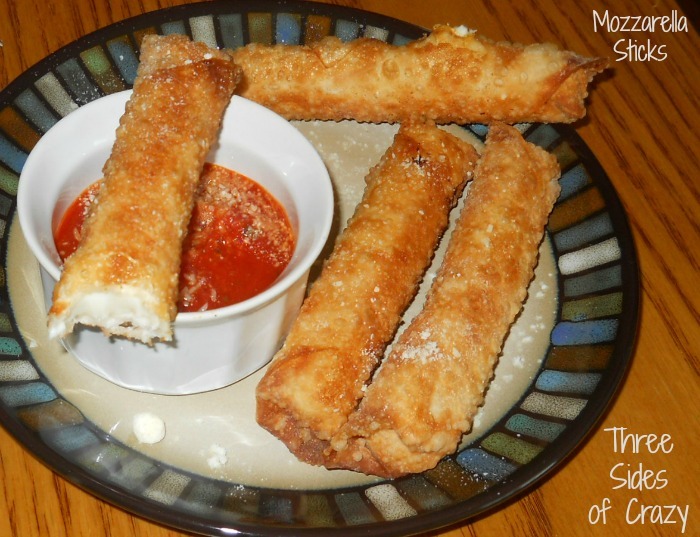 Martha over at Seaside Simplicity began Tailgating Time a while back anhd it’s just plain fun not to mention a wonderful source for new recipes to try. We will repost the linky on or around the first of each month as a reminder. 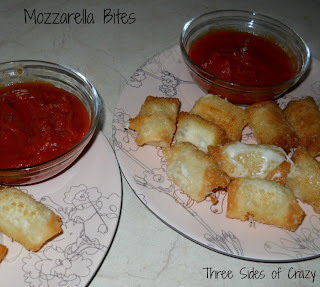 This is what we’re having tonight, Mozzarella Bites and you can find the recipe here. This time I cut the wonton wrappers and string cheese into 4 pieces each to make bite size pieces. 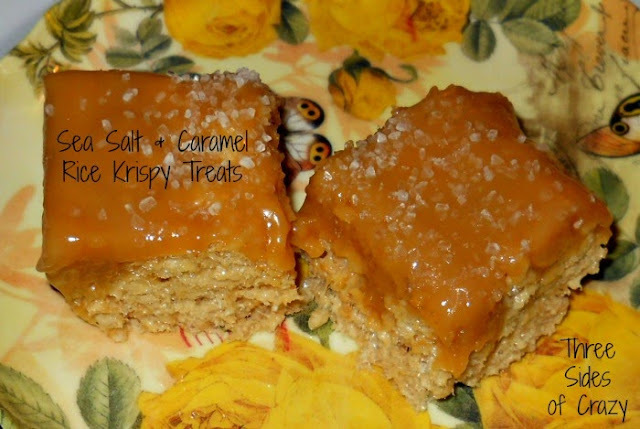 In a medium sauce pan over a low-medium heat stir together the sweetened condensed milk, the caramels and 1/4 cup unsalted butter until smooth. Line a 9×13 baking dish with foil, extending over the edge. Spray with non-stick PURE or PAM. Melt butter in large sauce pan. Add marshmallows and stir until just melted. Add vanilla, 1 teaspoon of salt and 1 cup of caramel sauce and stir until smooth. Stir in rice krispies until evenly coated. Pour remaining caramel over rice kripy treats and spread even with a spatula. Sprinkle remaining sea salt over top. **I use a stainless steel spatula that has been sprayed with PURE to keep it from sticking. It helps to press down firmly to get an even level. WOW we’re already into week 2 of preseason football. I know not everyone enjoys football, but who can resist a good football food buffet? 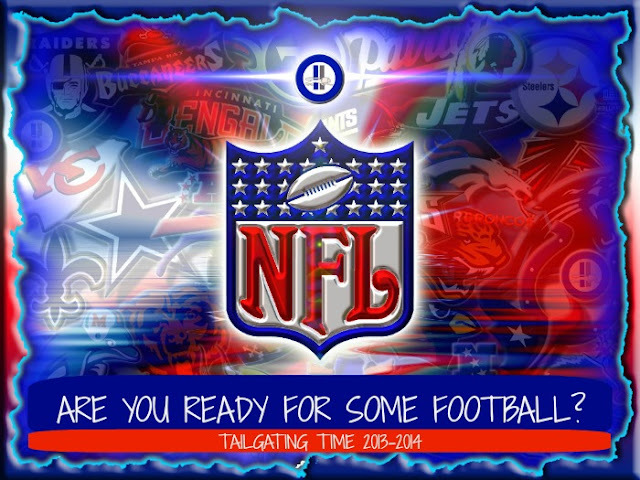 It’s time to start thinking about tailgating treats, appetizers, chips and dips, wings, and all the other yummy party things! We are big football fans here. The games are always party times even if it’s just the family. Having a game day buffet just makes it more festive! I remember when I was a kid. My dad was a big LOS ANGELES RAMS fan. We always watched the games together and I was responsible for keeping the game food fun. I loved spending the day with my dad and it was always so much fun. So how about we get this party started?! Come join us. Link up all your favorite tailgating goodies throughout the entire 2013-14 football season! I will repost the linky on or around the first of each month as a reminder. Start in the corner of the egg roll wrapper and roll cheese half way. Brush remaining open edges with water and continue rolling until well sealed. Heat 1/2 inch of oil to 375˚. Fry sticks a few at a time until golden brown all the way around.